The Center for Industrial Research and Service (CIRAS) is the industrial extension arm of Iowa State University, one of the nation’s premier land-grant institutions. The CIRAS mission – to enhance the performance of Iowa industry – is an integral part of the history of Iowa State and the ISU Extension Service. In the mid-1800s, a movement was undertaken in the US to create colleges to educate the “sons and daughters of the working classes.” This movement resulted in legislation called the Morrill Act, which created the Land Grant College System. President Abraham Lincoln signed the Morrill Act in 1862 and Iowa was the first state to accept the provisions of the law for its frontier college in Ames, Iowa Agricultural College and Model Farm. Today there are 105 land grants. Agriculture was one of the main courses of study at the newly-established college and dissemination of knowledge was important from the beginning. Farmers’ Institutes conducted during the winter of 1870-71 by Adonijah Welch, the college’s first president, and agriculture professor Isaac Roberts were some of the first extension programs offered by a land-grant institution. From the start, advances in research were considered a critical component of a land-grant mission. Faculty members Seaman Knapp and Charles Bessey drafted legislation that culminated in the Hatch Act of 1887, establishing the agricultural experiment station system. The act charged land-grant colleges with developing a research organization to advance science to solve problems for the food, agricultural, and natural resource systems. The Iowa Agriculture and Home Economics Experiment Station was created on March 2, 1888. In 1898, the college was renamed Iowa State College of Agricultural and Mechanical Arts. In January 1902, Perry Holden, an employee of the Funk Brothers Seed Company, gave one of the first “short courses” held at Iowa State. Encouraged by the success of Holden’s presentation, President William Beardshear and Agriculture Dean Charles Curtiss encouraged Holden to join the Iowa State faculty. 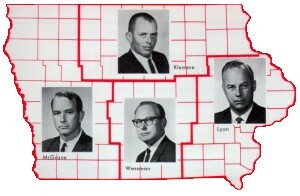 Later that year, Holden took a 35% pay cut and joined the agronomy department, in part because he felt that “success in life is measured by the greatest good that can be accomplished for the greatest number.” Holden helped to initiate many programs at Iowa State that became models for national Extension programs. With assistance from Jessie Field Shambaugh, his Boys’ Corn Clubs evolved into 4-H. In 1903, he introduced the nation’s first county extension plan and helped establish the first county cooperative experimental farm, which was located in Sioux County. Holden also helped pioneer Iowa State’s distance education efforts. The first community short course was held in Red Oak in 1905. As the distance education program grew, more speakers were added, including Iowa State students. The same year, Holden organized the “Seed Corn Gospel Train,” which traveled throughout Iowa to help farmers deal with a critical shortage of seed corn. Holden also helped draft the bill that created Iowa’s state extension service. The Iowa legislature enacted the Agricultural Extension Act in 1906 to make funds available for agricultural demonstration projects. It is believed that this was the first specific legislation establishing state extension work. Iowa State College took responsibility for the state extension service in 1906, which led to the creation of a Department of Extension at the college. Holden became the first director of the new Extension Service. 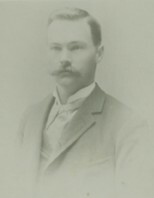 M. L. Mosher, Holden’s assistant on the Seed Trains, became the first county extension agent when he accepted a position in Clinton County in 1912. In 1913, the Iowa legislature enacted the Farm Aid Association Act, which permitted and later required each county to appropriate funds for county extension work. Within five years, each county had an extension worker in place. Staff positions to provide leadership in home economics and 4-H soon followed. The pioneering research and extension work taking place on campus in the Agriculture College was also being nurtured in the Division of Engineering (later, the College of Engineering). The roots of engineering extension in Iowa trace back to the efforts of Iowa State’s first engineering dean, Anson Marston. In 1904, Marston developed the nation’s premier Engineering Experiment Station – the first research agency organized in an engineering school. The purpose of the experiment station was to support faculty research in the emerging areas of science and technology, and then transfer the results to the state’s industries. Marston also pioneered the development of the Engineering Extension Service (EES). The EES was established in 1913 to help the transfer of technology from the experiment station. Cooperative extension maintained roughly the same structure for the next 50 years. In 1959, the college was officially renamed Iowa State University of Science and Technology. In the early 1960s, manufacturing was the largest component of Iowa’s Gross State Product, yet there were few mechanisms to provide widespread university assistance to this critical segment of the state’s economy. Outside of Iowa, only a few states provided industrial research and economic development services. Early efforts to provide technical assistance to manufacturers can be traced to new activities developed in 1961 within existing programs at North Carolina State University and Georgia Tech, and to a new program developed in 1963 at the University of Tennessee. Iowa was soon to find itself in the company of these forward-looking states. Manufacturing in Iowa was growing in the early ’60s. Industry representatives approached Iowa State for help but in many instances they were unable to locate or receive the assistance they needed. The College of Engineering Advisory Council advised Dean George Town to investigate ways to provide assistance to industry. A study group, formed from members of the college, visited other research and service groups throughout the US including the Armour Research Foundation, Chicago; the Research Triangle Institute, Durham, NC; and the Spindletop Research Institute, Lexington, KY. The group ultimately decided that to meet the needs of industry, Iowa needed a center similar to Engineering Extension instead of a research institute. A model for CIRAS was developed and Town began selling the idea in 1962. In July 1963, the Iowa legislature appropriated funds and authorized the Board of Regents to establish CIRAS to counsel industry on special problems, advise on appropriate procedures for growth, and conduct research and testing programs where necessary. CIRAS was also charged with providing technical and managerial information through publications and conferences specially designed for industry use. Counseling services were to be offered at no charge; research, however, could be financed by the interested industry, depending on the need and the potential for the state. The Des Moines Register published an article about CIRAS on July 30, 1963, and calls from industry soon followed. Dean Town hired Henry Palmer, a 1960 civil engineering graduate of Iowa State, as the first CIRAS employee. Palmer worked out of Town’s offices until more permanent space could be located. In September 1963, Waldo Wegner, a professional civil engineer and Iowa State’s first basketball All-American, was named the first CIRAS director. Following the successful agricultural extension model, CIRAS staff were located both on-campus and across the state, allowing enhanced access to campus resources and providing timely local assistance. Ames staff were housed in temporary barracks, Building E, on central campus for the first 18 years of operation. The building was one of 15 war surplus buildings erected on the Iowa State campus in 1947. Harley Boeke, an Iowa State civil engineering graduate, was the first CIRAS field representative. By 1966 there were four field staff with backgrounds in industrial administration, agricultural engineering, dairy industry, and industrial education. These field staff assisted companies in their assigned geographic areas but also provided assistance in their areas of expertise outside of their regions. CIRAS became part of Iowa State University Extension on March 1, 1966, when the short courses service group, farm demonstrations service group, Engineering Extension Services, and CIRAS were merged to establish a new entity, University Extension. The federally-mandated Cooperative Extension continued to encompass the other four areas of Extension – agriculture, youth, families, and communities. Although CIRAS was not staffed to provide solutions to all industry problems, they were able to help industry define problems and then provide connections to educational services and technical/management assistance. This included referrals to both private firms and individuals, as well as to college faculty. In the ’60s, roughly half of the requests for assistance were of a technical nature. Additional requests included feasibility studies, market analyses, marketing plans, and management counseling. In the early 1970s, inadequate business records, lack of clear lines of authority, and shortage of working capital were some of the most widely encountered problems by Iowa’s small manufacturers. But by the mid ’70s, energy uncertainties, unemployment compensation, and the impact of computers on manufacturing were the top concerns. In 1981 the Ames CIRAS staff moved to the Engineering Annex building on campus, where they remained until moving to the ISU Research Park in 1989. Quality circles were a popular subject with Iowa manufacturers. Several of the programs developed by CIRAS and projects staff worked on with Iowa industry received national awards. The productivity improvement methods of Deming and Goldratt were in demand in the early 1990s. By the late ’90s, CIRAS was becoming actively involved in Lean manufacturing. CIRAS also diversified the technical expertise of its staff. CIRAS had aerospace, ceramic, chemical, civil, electrical, industrial, and mechanical engineers on staff by the late ’90s. The diversity resulted in more interaction with campus faculty and better access to campus facilities, which led to an increased variety of technical assistance for small manufacturers. CIRAS also began hiring a large number of students to assist on projects. This provided enhanced educational opportunities for the students, economical solutions for Iowa’s small manufacturers, and a new conduit for Iowa’s companies to hire engineering graduates. The Ames staff moved back to campus in 1999, locating in the newly-completed Howe Hall for more than a decade. During renovation of engineering buildings on campus, staff held temporary residence in the Extension 4-H building on campus. In 2016, the Ames CIRAS office moved back to the ISU Research Park, housed in the newly-completed Economic Development Core Facility. The new building was intended to create a single point of contact for any business seeking economic development assistance from Iowa State. Today, CIRAS staff provide educational and technical assistance in the broad categories of bioindustry, energy, engineering, management practices, procurement, productivity, and quality management. CIRAS programming and projects with Iowa manufacturers continue to receive national awards. The structure of CIRAS service delivery methods has changed little over the last 50 years. Educational services are provided through seminars, workshops, and one-on-one meetings across the state. In the ’70s, workshops on cost management, cash flow planning, job shop costing, industrial lending for bankers, industrial marketing, and topics associated with OSHA were held at sites across Iowa. Additional information is disseminated through the CIRAS newsletter. The first issue of CIRAS – News for Iowa Industry was published in Sep/Oct 1966. Initially published six times per year, the newsletter became a resource for manufacturers to locate federal, state, and university resources; educational seminars; and manufacturing news. The newsletter has included guest articles, highlights of projects with Iowa companies, and information on cluster activities. A variety of lists have been published over the years, including short course offerings, industrial wastes for exchange, and inventions available for licensing. The newsletter became a quarterly publication in 1990, in an effort to cut costs. To date, more than 200 issues of CIRAS News have been published. Dissemination of CIRAS information went worldwide in 1995 when CIRAS posted its first Internet web pages. Initially developed as part of an effort to improve access to CIRAS by rural manufacturers, the site has grown and now includes educational materials, information on manufacturing in Iowa, and links to manufacturing resources. Activity has grown from 10,000 page hits per month in the first year to more than 50,000 per month. In 1998, PC Novice Guide to the Web selected the site as one of the top 2,500 sites on the Internet. Throughout its history, CIRAS staff have explored numerous opportunities to amplify resources made available to Iowa manufacturers by partnering with state and federal agencies. In 1965, the governor selected CIRAS to manage the federally-legislated State Technical Services Program, which was administered by the Department of Commerce. The legislation specified the goal and the method – wider diffusion and more effective application of science and technology in business, commerce, and industry are essential to the growth of the economy, higher levels of employment, and the competitive position of United States products in world markets. In the first year, Iowa State teamed with five institutions – the University of Iowa; Drake University; and Clarke, Buena Vista, and Morningside colleges. Short courses, seminars, conferences, and access to federal research abstracts and technical publications were used to disseminate information. The effort was discontinued at CIRAS in 1970 when the federal funding was eliminated. In 1980, CIRAS was awarded funds from the Economic Development Administration’s University Center Program to provide economic development assistance to Iowa industry. Within a year, the center began offering technical assistance, which continues to be its principal focus. The center has a mission to provide technical assistance to manufacturers and entrepreneurs in economically-disadvantaged regions in Iowa. Since its inception, CIRAS has helped launch a variety of industry programs and associations. The Small Business Development Center, funded by the US Small Business Administration starting in 1981, was originally administered by CIRAS. Though normally located in business colleges, the Iowa SBDC was located at CIRAS because the business college at Iowa State was just getting established. In addition, CIRAS already had a history of providing assistance to businesses and with partnering with other institutions, which made the SBDC a good fit. Originally managed by Lloyd Anderson, the program provided management assistance to all small businesses in Iowa. CIRAS restricted its assistance to manufacturer’s problems and referred non-manufacturing requests to one of the four original regional centers at Iowa State University, the University of Northern Iowa, the University of Iowa, and Drake University. The SBDC program was moved under the College of Business in 1985. Martin Poe, an extension resource development specialist, assisted with the development of the North Iowa Area Development Manufacturers’ Group (NIAD) in 1975. The non-profit advocacy organization later changed its name to NIAD Business and Industry. More recently, the name was changed to the Business and Industry Group of North Iowa (BIG). Poe was hired by CIRAS in 1976. A year later, he started the Cedar Valley Manufacturers Association (CVMA) to promote and serve industry in the Cedar Valley community. For most of its duration, volunteers operated CVMA; and the group asked CIRAS to manage operations for a time. Just as CIRAS has been an incubator for other activities, it has also been asked to include other state and university programs within its management structure. The Iowa Procurement Outreach Center was initiated in 1986 in Cedar Rapids to offer counseling and technical assistance to Iowa firms wanting to provide goods and services to the federal government. The center, operated by the Iowa Department of Economic Development (IDED) and funded in part by the Department of Defense, was one of the first procurement technology assistance centers in the nation. The center moved to IDED’s Des Moines offices in 1994 and became a part of the Small Business Resources Office. In the late ’90s, as the Department of the Defense began focusing on e-commerce procurement, it became clear that the services would be more aligned with manufacturing clientele. CIRAS was seen as a natural fit and the center was transferred to the CIRAS main office in Ames in 2000. The name of the center was changed to the Procurement Technical Assistance Center in 2005 to align with the naming of the federal program. This is now known as the Procurement Technical Assistance Program (PTAP). After 90 years as a separate Extension entity, the Engineering Extension Service was included under the CIRAS umbrella on July 1, 2002, to provide a more seamless link between manufacturers and faculty in the College of Engineering. Educational workshops were offered at the conference center on the ISU campus in a wide variety of areas – including transportation, sewage treatment, water treatment, and power systems. CIRAS became a partner in the Iowa Manufacturing Technology Center (MTC) in 1994. Funded by the Department of Commerce, MTC was a natural fit with CIRAS because its mission is closely aligned with the missions of CIRAS and ISU Extension – to assess the needs of small manufacturers and provide a link to resources to improve the profitability of Iowa industry. The organization changed its name to the Iowa Manufacturing Extension Partnership (Iowa MEP) in 1999 and the roles of MEP and CIRAS staff were slightly modified to eliminate overlapping efforts. In 2005 MEP was integrated with CIRAS to reduce administrative costs. MEP staff currently provide a point of contact and assessment role to Iowa manufacturers and CIRAS staff have elevated their levels of technical expertise to provide the latest technical and educational opportunities to Iowa’s manufacturers. Since it originated in 1965, more 100 Iowa companies have participated – providing guidance to the CIRAS director and staff. The first chair of the CIRAS Advisory Council was Ralph Schlenker of Iowa Power and Light in Des Moines. Information about the current Advisory Board membership is available here. The basic premise that led to the creation of Extension more than 100 years ago, and to CIRAS 60 years ago, still holds today – Extension is to make the knowledge base of the land-grant university available to the people of the state. The needs of the people drive the education, thereby improving the lives of the people. CIRAS staff are committed to improving the lives of the people of Iowa by providing the latest education, research, and technical assistance to enhance the performance of Iowa industry.